I’m in love with this pie. It’s a galette – a free-form pie that is usually very rustic and can be sweet or savory, or even resemble a thin pancake in some regions of France. I love it because it eliminates the pressure to make a pretty pie crust. So many people struggle with pie crust, and when the edges crack, it can make even the most tempered person lose their cool. But the galette solves all that. You simply roll out your dough, fill it up and fold the edges over. If you add an egg wash and some crunchy sugar sprinkled over the dough, no one in the world will care that it isn’t in a pie plate! 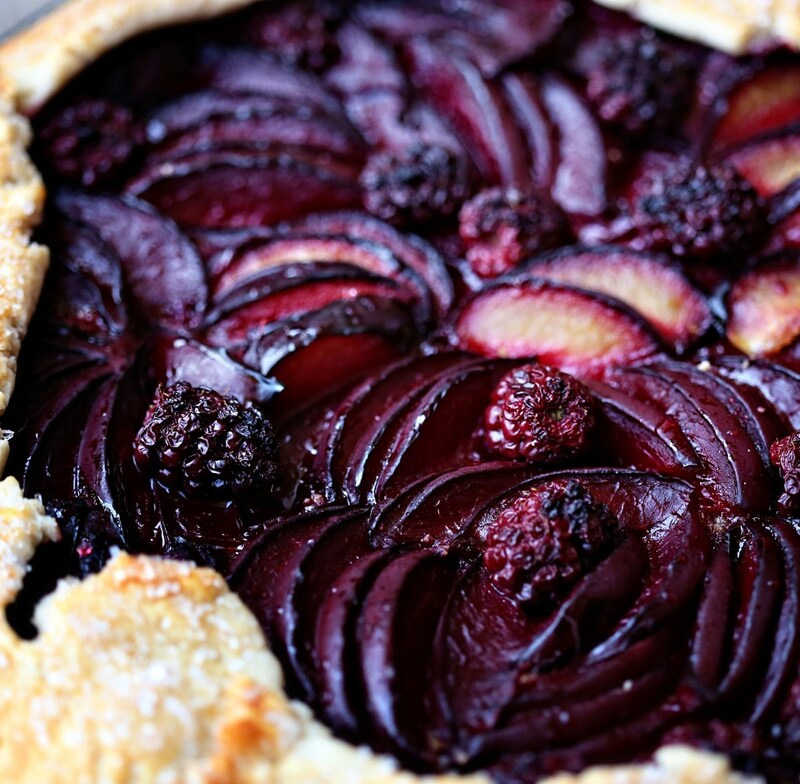 We enjoyed plums and a few blackberries in this pie because they were ripe and in season and cheap! I really don’t buy fruit if it isn’t on sale. I just figure that sale price tells me what’s in abundance and that’s an easy way to know what’s in season! In a food processor, combine 2 1/2 cups flour, butter, 1 teaspoon sugar, and salt; pulse until mixture resembles coarse meal. Sprinkle with 1/4 cup ice water. Pulse until dough is crumbly but holds together when squeezed (if necessary, add up to 1/4 cup remaining ice water, 1 tablespoon at a time). Don’t overmix! Remove dough from processor and shape into a disk; wrap in plastic and refrigerate 1 hour. Meanwhile, wipe bowl of food processor clean and add almonds, 3 tablespoons sugar, and 2 tablespoons flour; pulse until ground to a coarse meal. Preheat oven to 350 degrees. On a floured surface, roll out dough to 1/4-inch thickness. Transfer to a parchment-lined baking sheet; sprinkle almond mixture over dough (this is necessary for absorbing the juices from the fruit so your crust won’t be a soggy mess. Plus, it tastes great.) 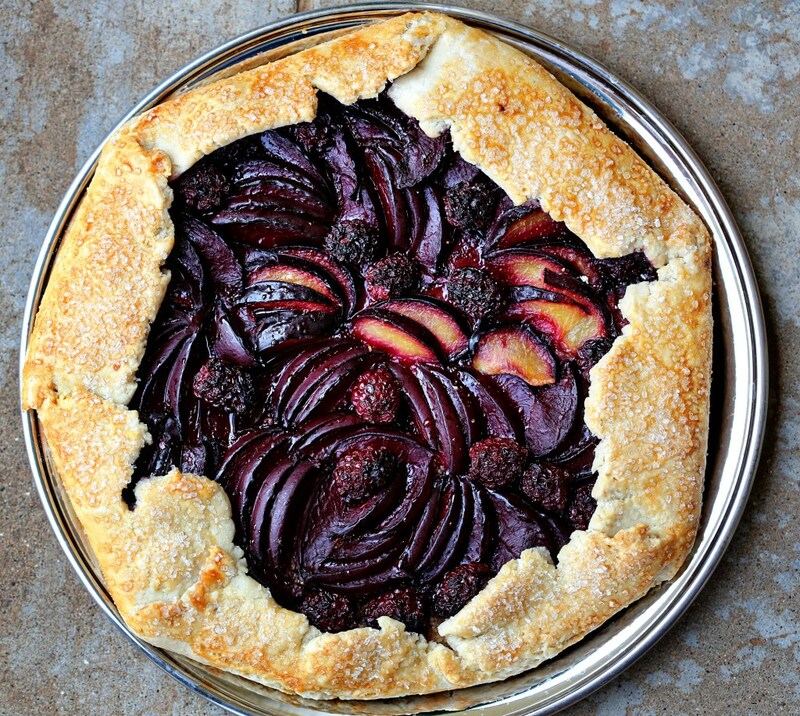 With a spatula, transfer plums to dough; press lightly to fan out, leaving a 2-inch border. Fold edge of dough over fruit. Refrigerate 20 minutes (this is so your butter doesn’t leak out). Brush crust with cream (I used an egg); sprinkle galette with 2 tablespoons sugar (I used super crunchy sugar!) Bake until crust is golden and underside is cooked through, about 70 minutes. This entry was posted in Baked Goods, Breads, Butter, Desserts, Fruity, Pies, Weekend Fare and tagged blackberries, flour, free form pies, galette, martha stewart plum pie, pie, pie crust, pie dough, plum galette, plums, sugar, tart. Bookmark the permalink.